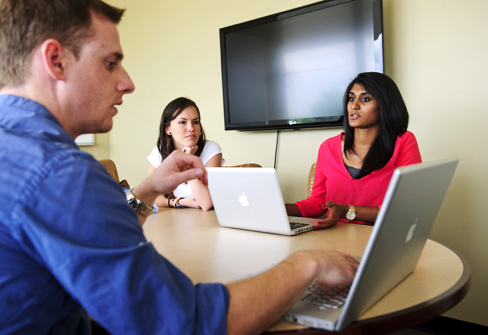 Alex Thibeault, Arianna Hoet and Anjali Gowda (pictured left to right) plan the implementation for their LinkedUp mentoring program, which begins Fall 2012. NC State's Institute for Emerging Issues brings people together around complex issues in pursuit of a single goal: to ensure North Carolina's future competitiveness. This year, the Institute offered a 2012 Emerging Issues Prize for Innovation to the high school team and the college team that developed the most innovative ideas to increase North Carolina's high school graduation rate. Nearly 70 teams submitted applications. After more than 12,000 votes, this year's college winners were UNCG's own Alex Thibeault, Anjali Gowda and Arianna Hoet for their LinkedUp program. The students, who are part of UNCG's doctoral program in clinical psychology, won $5,000 to launch the project. The concept of LinkedUp is to connect ninth graders with fifth graders for a four-year mentor-mentee relationship. To build awareness and support for their mentoring program, the team is currently creating a club on campus and is in the process of writing a constitution to guide the club's work. They have already recruited three mentor advisors (UNCG undergraduates) to help train and provide support to the ninth grade mentors. The cascading nature of the project is unique. Graduate students, undergraduate students and high schoolers mentor fifth graders, who in turn will become high school mentors themselves. Their plan for the next year involves creating a handbook for mentors/mentees, developing a recruiting strategy and planning training sessions. They have been working with staff at the Center for Creative Leadership to develop a screening procedure and guidelines for recruitment, and they have been collaborating with researchers to ensure their program is aligned with youth mentor best practices. The team will submit quarterly progress reports about LinkedUp so that the Institute can share implementation work. On Feb. 11-12, 2013, Thibeault, Gowda and Hoet will be invited back to the 28th Emerging Issues Forum to report their progress.